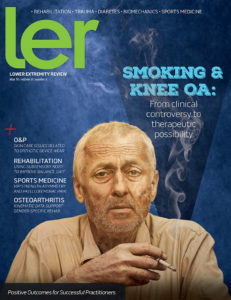 Experts say perplexing studies suggesting that smoking may be protective against the development of knee osteoarthritis (OA) should not deter clinicians’ efforts to discourage smoking—even in patients who are at risk for OA. 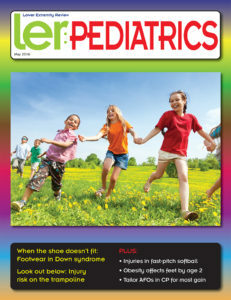 Many, many stories in both LER: Pediatrics and its parent publication, Lower Extremity Review, highlight the biomechanical and physiological effects of being over­weight or obese. The Washington, DC-based American Orthotic & Prosthetic Association (AOPA) on May 2 wrapped up its 2016 Policy Forum with its first-ever O&P Legislation-writing Congress. The International Osteoporosis Foundation (IOF) Fracture Working Group in April published its conclusions on the effect of osteoporosis medications on fracture healing. The Owings Mills, MD-based Board of Certification/Accreditation (BOC)’s Board of Directors in May approved a plan to sunset the acceptance of new applications for its orthotist (BOCO), prosthetist (BOCP), and pedorthist (BOCPD) certifications. Hauppauge, NY-based OHI on May 3 announced the appointment of Lynn Homisak, PRT, CHC, as central casting program consultant for the company’s on-demand pedorthic service. The Elwood, IN-based Robert M. Palmer, MD, Institute of Biomechanics (RMPI) reported that OrthoSleeve brand maker ING Source has committed to a second year of scholarship support for students of the nonprofit institute. Stuart Goldman, DPM, a board-certified foot and ankle surgeon who practices at Help for Your Feet in Owing Mills, MD, recently published his book, Walking Well Again: Neutralize the Hidden Causes of Pain. Results from a small study of Reykjavik, Iceland-based Össur’s new Hip Unloader brace published in April showed nine of the 14 participants with unilateral symptomatic hip osteoarthritis (OA) reported an immediate reduction in pain with application of the device. Beerse, Belgium-based Janssen Pharmaceutical’s top-selling diabetes drug Invokana (canagli­flozin) continued to come under scrutiny in April and May with new lawsuits filed, along with questioning from the European Medicines Agency (EMA) about serious potential adverse effects. Freedom Innovation’s Board of Directors on April 26 named David A. Smith chair and CEO of the Irvine, CA-based company. Effingham, IL-based Joint Active Systems (JAS) reported on May 3 that it has acquired the Empi Advance ROM line of dynamic braces from Empi, a subsidiary of San Diego-based DJO Global. JAS plans to reintroduce the Empi Advance ROM line by July. Vancouver, Canada-based CAD-CAM software company Vorum in May announced a partnership with Nia Technologies to deliver 3D-printed orthotics and prosthetics to children in developing countries. Tampa, FL-based Bauerfeind USA in April hosted healthcare professionals and business partners in Dallas for a two-day event featuring Dirk Nowitzki, star forward for the Dallas Mavericks and Bauerfeind global brand ambassador. Coral, a leading brand of coral minerals, now offers Coral Complex3 and Daily D, two supplements to help support healthy bones. Daily D provides 500 IU (1250% DV) of the “sunshine vitamin”, vitamin D3. In addition, it provides 100 mg of coral calcium per capsule. Vicon’s new flagship camera, Vantage, combines technology with accessible design to open up motion capture to a broader audience. The camera’s individual components have been designed to work together to provide up-to-the-minute informa­tion so the user can make adjustments in real time. Quell utilizes NeuroMetrix’s patented, wearable intensive nerve stimulation (WINS) technology to provide drug free, widespread relief from chronic pain. Worn just below the knee and activated by clicking a button, Quell stimulates the sensory nerves to trigger the body’s natural pain relief system and block pain signals in the body. Corflex introduces the Contender Post-Op Knee Brace. The brace features a simple adjustment system to minimize fit time after surgery and weighs just 27 oz. The ZipTrak Telescoping System adjusts brace length from 18″-26″ in 1/8″ increments and allows for the adjustment of intermediate cuffs to help avoid incision sites. BetterDoctor helps healthcare practices create and manage their online presence and builds tools to bring trust, confidence, and transparency to the process of finding a doctor. The company works to fix incorrect contact information across the internet and get reviews on applicable industry websites. New for spring, Spenco has launched a line of structured memory foam footwear, with the initial softness of memory foam and the added benefit of structural integrity. The new styles that feature memory foam are the Pure Sandal for men and women and the Thrust Slide for men.